Stockholm – Oct. 15, 2015 – Tobii, the global leader in eye tracking, today unveiled the Tobii IS4 eye tracking platform and Tobii EyeChip™, the world’s most advanced, compact and versatile eye tracking components for seamless integration into consumer devices. These new products enable premium grade eye tracking for a wide variety of consumer devices, including desktop and laptop computers, tablets, cars, virtual-reality (VR) headsets and many others. Both the Tobii IS4 platform and the Tobii EyeChip are now available for OEM pre-order through the Tobii Early Access Program. Powered by the EyeChip, the IS4 eye tracking module is the most cost optimized and compact eye-tracking platform in the world, providing OEMs and integrators a lightweight platform with near infrared sensors, illuminators, Tobii EyeCore™ algorithms, Tobii’s proprietary middleware engine and software development kit (SDK). 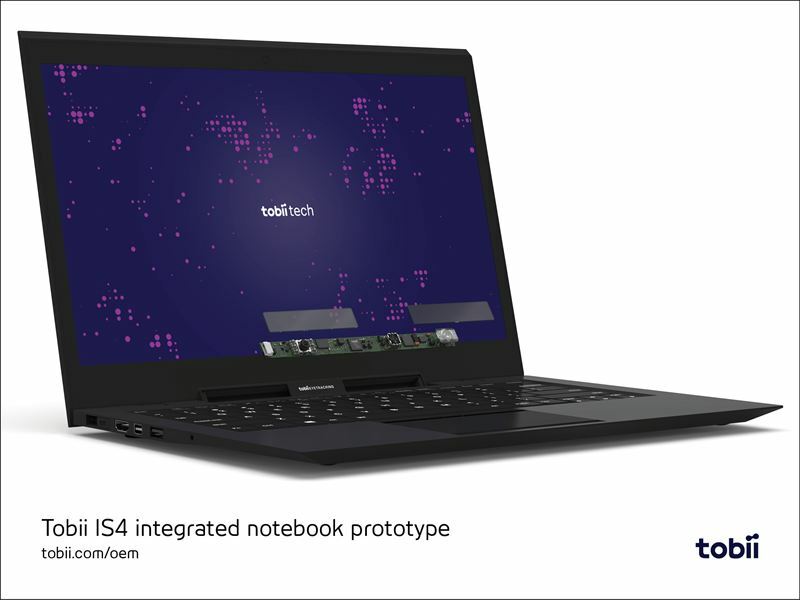 Engineered as the sixth generation Tobii eye-tracking platform, the IS4 is the first to meet integration requirements for consumer devices, such as low power consumption and the flexibility to integrate with multiple system design configurations. In addition, the platform also provides a foundation for a variety of third-party, multi-modality applications and interactions to be built with IS4, including facial identification, head tracking and facial feature tracking, enhancing the value that consumers and OEMs already expect from Tobii eye trackers. 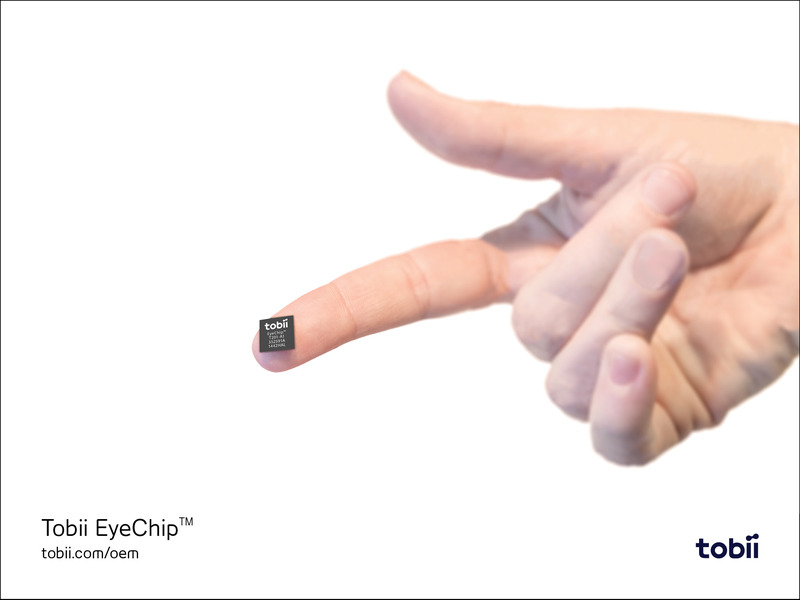 Tobii EyeChip is the world’s first system-on-chip (SoC), also called an application-specific integrated circuit (ASIC), developed specifically for eye tracking. With both hardware acceleration and vectorized processing, the EyeChip performs the on-chip processing of Tobii EyeCore algorithms and features integrated sensor and illumination control. Together, this provides unbeatable tracking performance and advanced, flexible power schemes, while dramatically reducing CPU load, bus load and power consumption compared to other eye tracking solutions. With this, device manufacturers can bring eye tracking to consumer devices, including PC peripherals, all-in-one PCs, desktop monitors, notebooks, detachable Ultrabooks, tablets, cars, as well as VR and AR headsets. With the EyeChip’s compact size and powerful processing, it provides particularly strong benefits in VR applications and devices as the chip optimizes power and performance without requiring a significant footprint within the device. Most recently, Tobii announced technical collaboration with Starbreeze Studios to explore eye tracking solutions in the high StarVR head mounted display (HMD). 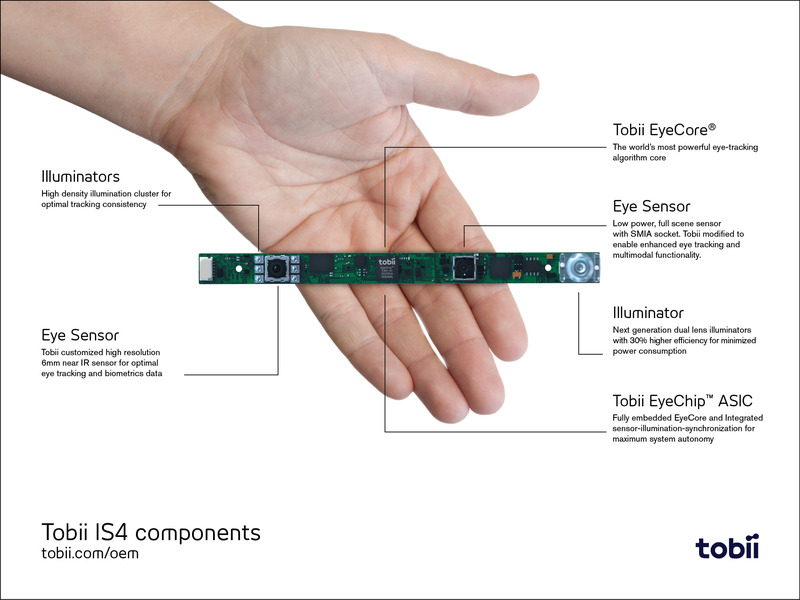 Tobii’s IS4 eye tracking platform and EyeChip are based on 15 years of development creating Tobii’s world-class eye-tracking systems as well as the world’s most comprehensive eye tracking patent portfolio. 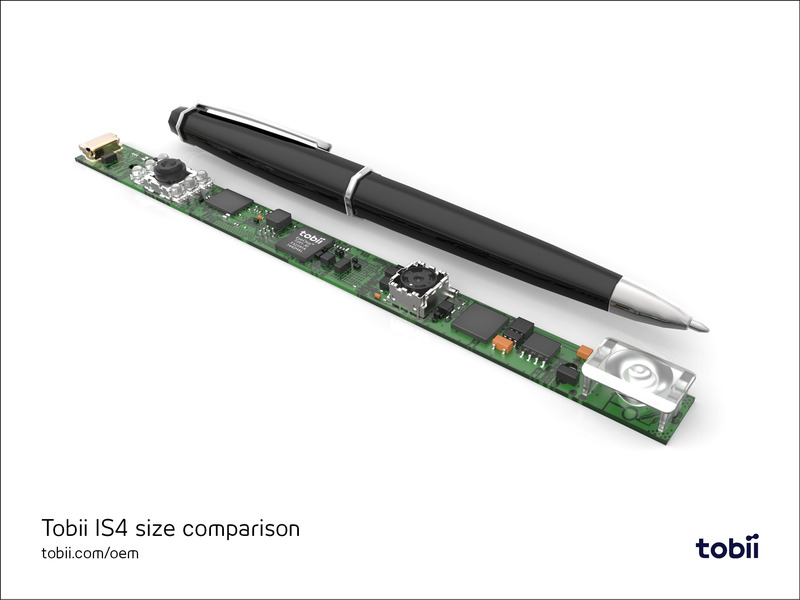 Combining this legacy with powerful processing and a small form factor, the IS4 platform and the EyeChip are engineered to make eye tracking more engaging, accurate and robust than ever before. For qualified system integrators and OEMs, Tobii is now accepting registrations for the Tobii Early Access Program. In the Program, participating OEMs will receive the Tobii IS4 eye tracking evaluation kit, integration guides, reference designs, comprehensive support and collaboration. Limited quantities are available, please register to secure a place in the program here. First units will ship in December. To view images of the Tobii IS4 and Tobii EyeChip, please visit the Tobii Pressroom. Tobii discloses this information pursuant to the Swedish Securities Market Act and/or the Swedish Financial Instruments Trading Act. The information was submitted for publication on October 15, 2015, at 4:00 p.m. CET. Tobii is the global leader in eye tracking. Our vision is a world where all technology works in harmony with natural human behavior. Tobii operates through three business units: Tobii Dynavox makes specially designed computers that are controlled by eye movement or touch screens for use by people with special needs due to spinal cord injuries, CP, ALS or other medical conditions. Tobii Pro develops and sells eye-tracking equipment and services used today by more than 2,000 companies and 1,500 research institutions, including 49 of the world’s 50 highest ranked universities. Tobii Tech further develops Tobii’s technology for new volume markets such as computer games, personal computers and vehicles. Tobii is headquartered in Sweden and is listed on Nasdaq Stockholm (TOBII). The group has approximately 600 employees. For more information, please visit www.tobii.com.